Hi everyone, hope you all are doing well. 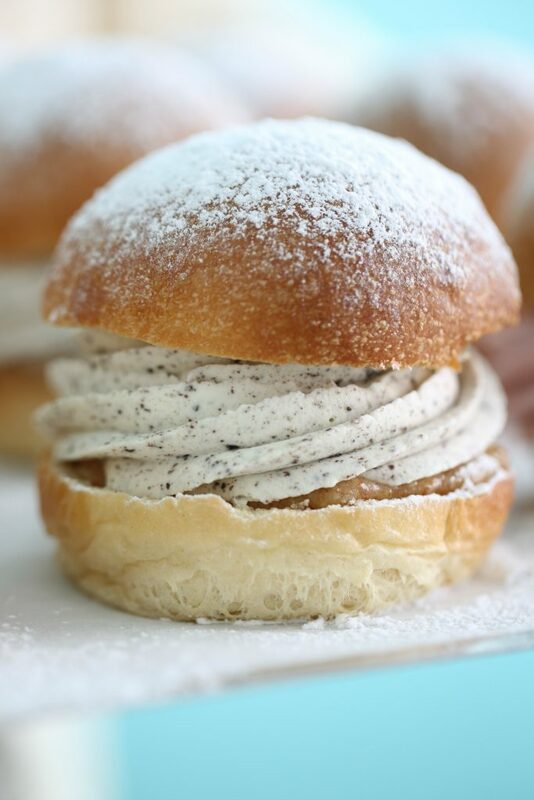 In Sweden and Norway, we eat a lot of sweet buns, especially in wintertime. In Sweden, we call these buns for Semlor, in Norway for fastelavnsboller.The typical one is one filled with an almond paste and whipped cream. I love it, but I love to try different flavors, These sweet buns are filled with a homemade almond paste and oreo frosting. 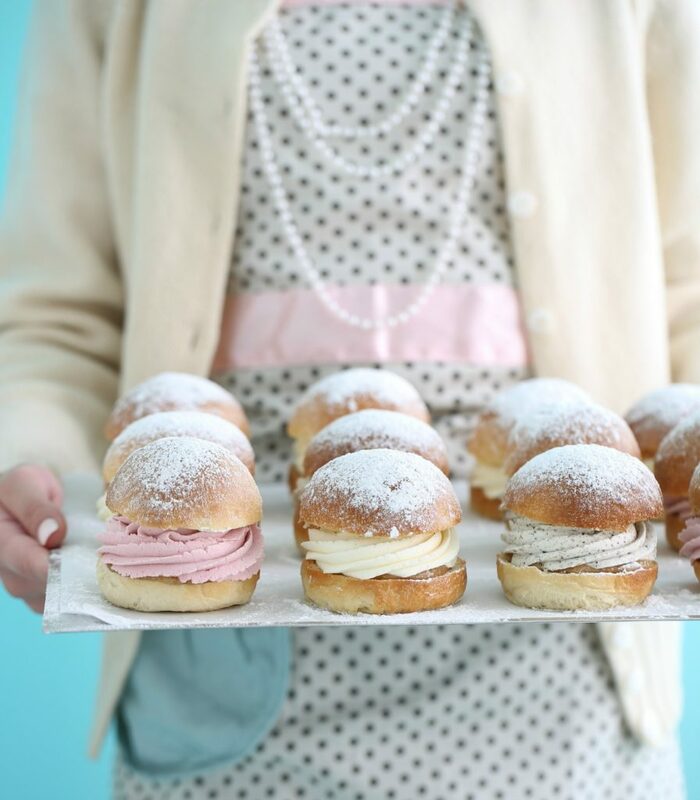 These buns you can fill with any whipped cream flavor you like, below i filled some with vanilla cream, raspberry cream. 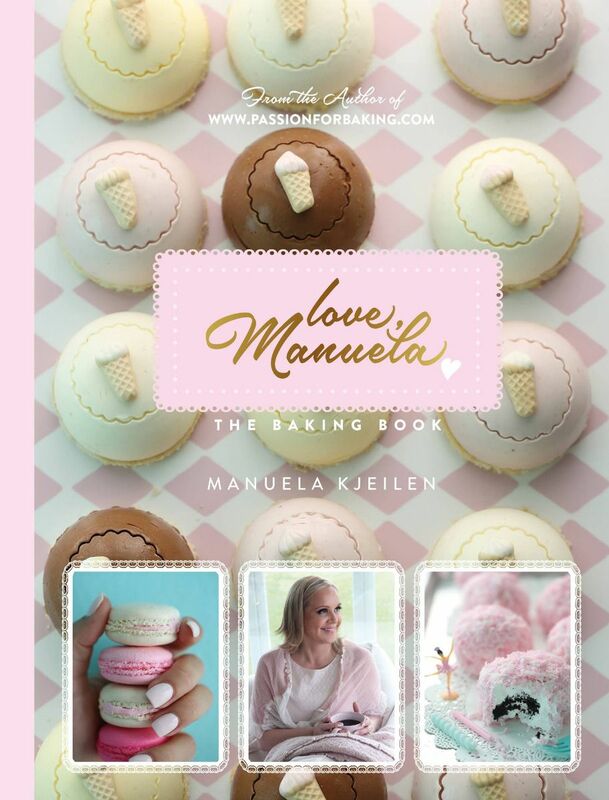 Use your tastebuds and have fun baking. Preheat oven to 350F°/ 180C° Line a large baking sheet with parchment paper. 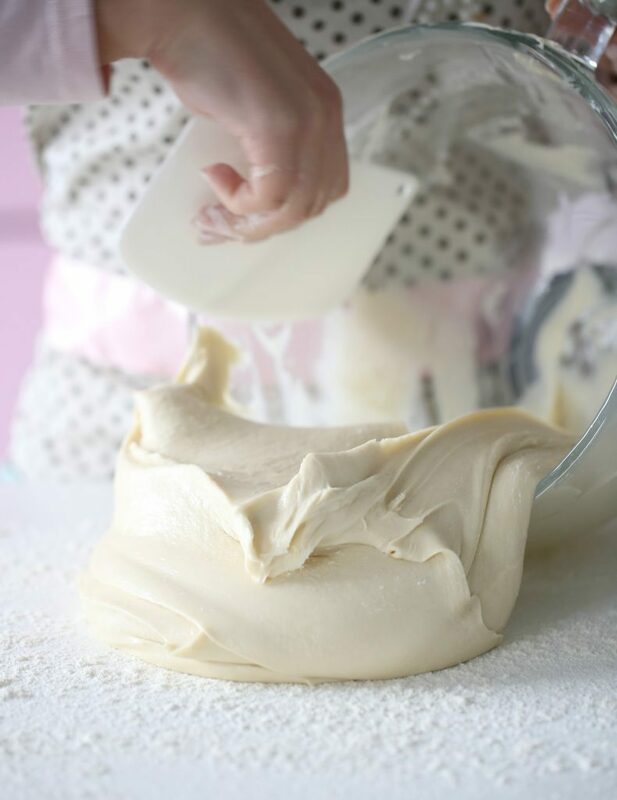 In a standing mixer bowl, hand-whisk milk and sugar until dissolved. Sprinkle yeast over milk, allowing it to dissolve and proof for 5 minutes; the mixture should be foamy. Whisk in eggs. Add both flours and salt (Note: it is important that the salt does not come in direct contact with the yeast, as it will kill the yeast, so add it with the flour to prevent this). Knead with dough hook on low speed until all ingredients have come together. Increase speed to medium and continue mixing for 10 minutes. With the mixer on low speed, add the butter to the flour mixture, a piece at a time. The butter needs to thoroughly be incorporated into the dough, so stop the mixer occasionally to scrape the sides of the bowl. Once the butter is completely incorporated into the dough, mix on medium speed another 10 minutes until dough is soft, slightly sticky, and somewhat shiny. Increase mixer speed to medium-high for 1 minute. You should hear a slapping sound as the dough hits the sides of the bowl. Turn out dough onto counter, flour your beautiful hands, and bring each corner of dough towards the center, working your way all around. Place dough seam side down, in a greased bowl, cover with a kitchen towel and let rise 45 minutes, or until doubled in size. When the dough has risen, divide the dough into equal pieces, I like to weigh each piece so they are equal in weight. Cover pan with a clean kitchen towel and let the dough rise until doubled in size. About 45 minutes. 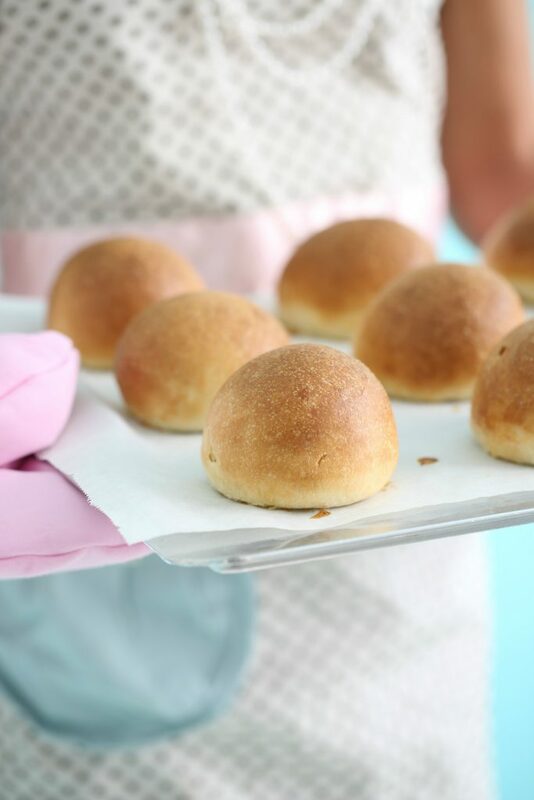 When ready to bake, brush each bun carefully with room temperature heavy cream. Bake the buns (I use the convection setting in my oven to make them fluffier) until golden brown on top and the edges, about 15 – 20 minutes. In a bowl add grounded almonds, egg white, confectionary sugar, vanilla and heavy cream, combine until it forms a paste, add more heavy cream if needed. 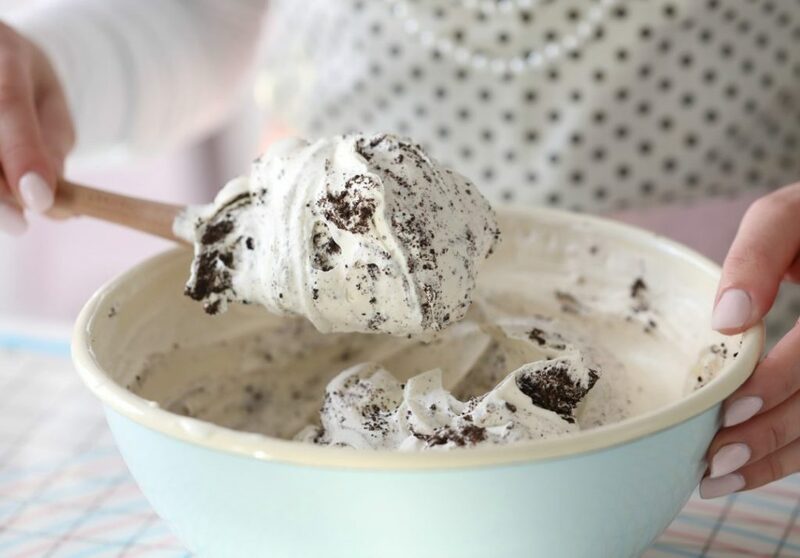 Make oreo frosting, get the recipe here. Place the oreo cream into a pastry bag, attached to a large nozzle or any nozzle of your choice. Making swirls with the cream on top of each almond paste bun. 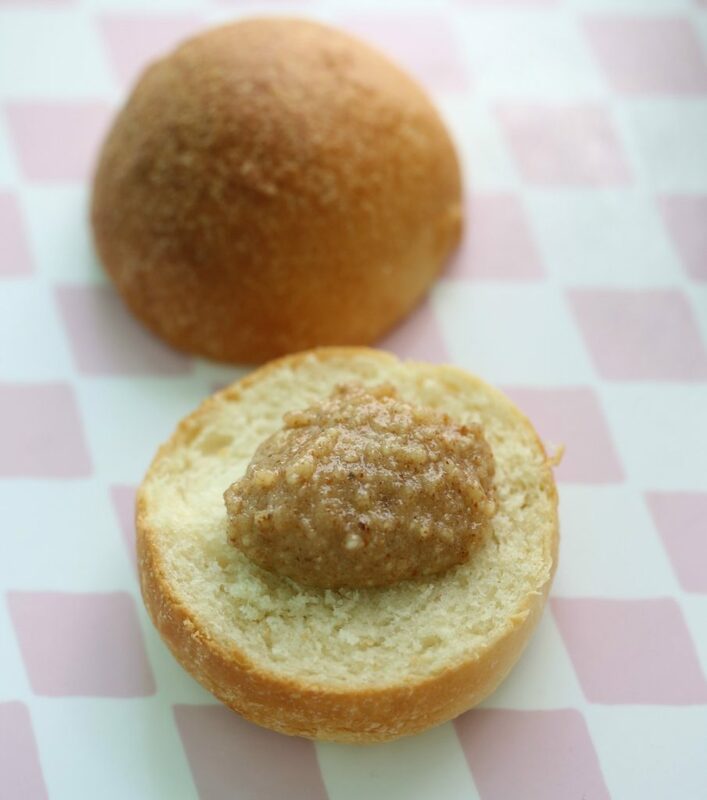 Top it with the other half of the bun, then dust it with some confectioners’ sugar, and enjoy!